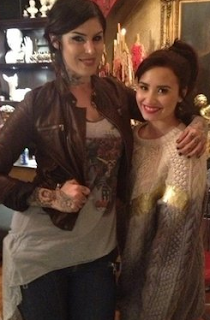 Famous tattoo artist Kat Von D (and girlfriend of Deadmau5) tattooed some beautiful birds on Demi Lovato. The tattoo is made up of 12 birds flying down her arm starting at her "Faith" tattoo. Demi posted the top photo along with a tweet to Kat, "Thank you so much @thekatvond for my new ink!! I think it's beautiful and I love it!" 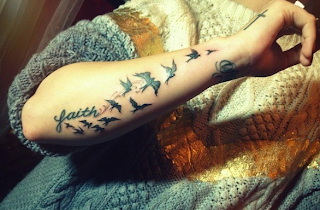 This is Demi's 13th tattoo, but her "Stay Strong" tattoo has received the most attention because the words cover up the cutting scars on her wrists. What do you think of her new tattoo?